The author’s non-recyclable waste for July. It’s the end of another Plastic Free July, and once again – even as a waste prevention consultant – I have failed to be plastic-free. 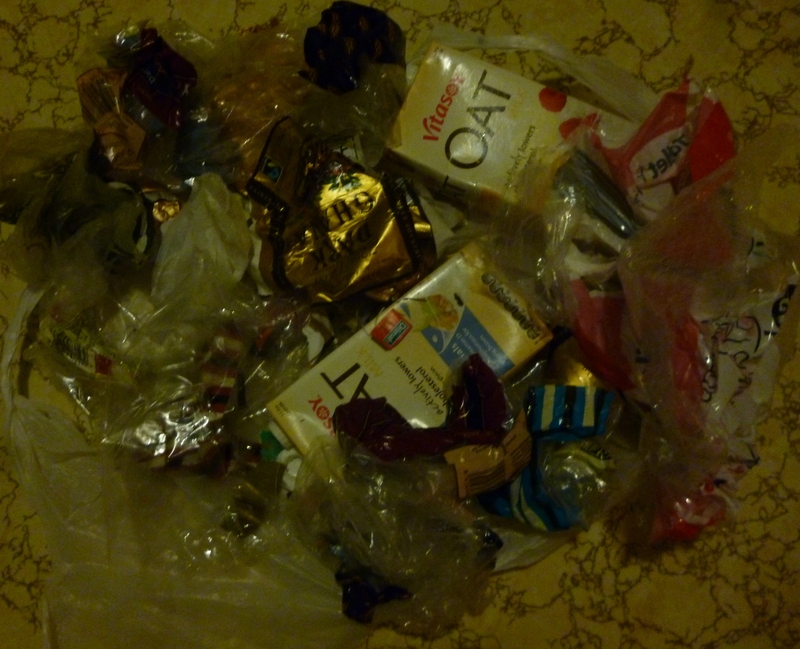 I have been slowly reducing packaging for fifteen years, taking reusable containers to Bin Inn, shopping at Farmers’ Markets, and making my own hair and skincare, but there are a few die-hard items for which I have yet to find affordable and convenient alternatives: bread bags, chocolate and cheese wrappers, oat milk cartons, and most recently, chicken feed bags. Being plastic free is bloody difficult, because the infrastructure to support us is lacking. Even a voluntary 5c levy on plastic supermarket bags failed because there was no law backing it up. Hence, Green MP Denise Roche spent Plastic Free July travelling around the country promoting her plan for a private member’s bill either banning or introducing a levy on plastic carrier bags. At the Lyttelton meeting (22nd July) I learned that New Zealanders use 1.6 billion plastic supermarket bags a year, and that the average time they are used for is 12 minutes. Announced to coincide with both Plastic Free July and the Green Party’s push to ban plastic bags, the scheme won’t reduce plastic but will rely on consumers to voluntarily return plastics to a supermarket collection point, from where it will be collected by Australian recycling company REDcycle and initially transported to Australia to be made into park benches and playground equipment (to eventually be worn down by wind, rain, and teenagers). Environment Minister, Dr. Nick Smith called the scheme “a more sensible approach than a ban or a compulsory levy on just plastic shopping bags”, citing that shopping bags make up only a small percentage of waste overall (a figure likely to include industrial and building waste). Yet, even if the scheme is rolled out nationally, the amount recycled may not represent a large percentage of that waste either, as not everyone will be motivated to separate their packaging, store it, and remember to take it back to the supermarket before bin day rolls around and an easier option presents itself. At Roche’s meeting, Rob De Thier, the owner of Lyttelton Supervalue pointed out some flaws in the proposal. He had limited space for extra bins, and was also concerned that any contamination would make them smell and attract flies and rodents. He is absolutely right. I have sorted hundreds of recycling bins, from events, schools, universities, and housing areas, and when audited by the number of items in the bin (rather than weighed) contamination rates can be as high as 90% and are rarely below 30%. According to Lyn Mayes, manager of the Public Place Recycling Scheme that will manage the project the scheme will take the following: “bread bags, frozen food bags, toilet paper packaging, confectionery and biscuit wrap, chip bags, pasta and rice bags . . . sanitary hygiene packaging – basically anything made of plastic which can be scrunched into a ball”. Bottom layer of a contaminated recycling bin. That is a dream list, but I bet Dr. Smith has never had to climb into a recycling bin to remove a base of gunk and nappies built up over several empties where the bottom layer stayed put. With biscuit crumbs, chips, peas, rice, and used tampons (which are often put back into the packaging) as potential contaminants De Thier’s concerns are valid. 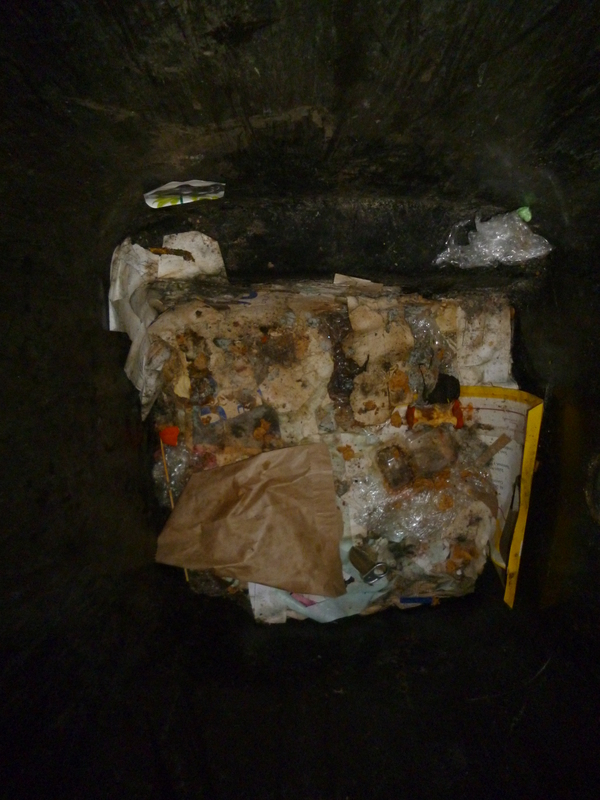 The bins could end up smelly, overflowing and a health risk in an area where food is sold. As much as my social enterprise Our Daily Waste relies on people wanting to recycle better, the reality is that easily accessible, unmonitored bins will be filled by anyone with rubbish, including freedom campers and those who do not want to pay council landfill rates. But where is this innovative packaging? It is not showcased on their website and I have yet to see much evidence of it on the shelves, or for that matter, in the bins. And how does it stack up against the mountains of landfill created by the bulk of the Packaging Council’s members? Voluntary schemes are not enough – we need legislation that targets the producers. Currently, waste levies are collected at the dumping end, but by adding levies to all plastic packaging at the cradle stage, there will be a financial incentive for packagers and their customers to find truly sustainable alternatives, supported by funding collected from the levies. A voluntary recycling trial is a band-aid solution to a much bigger problem. The production of plastic is depleting our remaining oil supplies, adding to C02 levels, choking our oceans, and entering our food chains, and it is time we gave it up. A levy on plastic carrier bags will be a start, but we need a government prepared to target all plastic packaging and support truly innovative design. Perhaps then, we could all achieve a Plastic Free July. This entry was posted in Landfill, Recycling, Reducing, Rethinking, Uncategorized. Bookmark the permalink.